"Modulation of Estrone Exposure Effects Mediated Through Environmental Factors in Male Fathead Minnows, Pimephales promelas"
Thesis Chair: Dr. Heiko Schoenfuss. Work is also St. 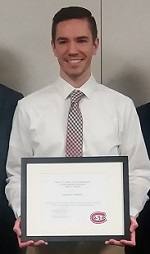 Cloud State University's nominee for the Midwestern Association of Graduate Schools Distinguished Thesis Award. Molly Tast, Community Psychology, First-Year College Students Attitudes Toward Disability: Assessment of Disability Inclusion Training. St. Cloud State University, St. Cloud, Minnesota, April 2017. Oral Presentation. Shana Rogan., Biology, The effect of Garcinia kola extract (GKE) on the T-cell composition and function in experimental type 1 diabetes (T1D)., St. Cloud State University, St. Cloud, Minnesota, April 2017. Oral Presentation. Sam Harvey, Biology, Study of Garcinia kola extracts antidiabetic properties in a mouse model for type 1 diabetes., St. Cloud State University, St. Cloud, Minnesota, April 2017. Oral Presentation. Anthony Kunkel, Physics and Astronomy, Light from Freezing Quarks., St. Cloud State University, Minnesota, April 2017. Poster Presentation. Michel Tchang, Anthropology, Biodistance analysis between Classic Neanderthal populations using non-metric features of the dentition., St. Cloud State University, Minnesota, April 2017. Poster Presentation. Wesley Davis, Biology, Mosquitos: A Threat to Minnesota Public Health, St. Cloud State University, Minnesota, April 2017. Poster Presentation. Oliveira, A.A., and Larson, A. (2016). Discover Your Path for Academic Success, at Power in Diversity Leadership Conference, January 2016, St. Cloud, MN. Seth Taft, Cultural Resource Management, "A Morphological Study of Projectile Points Recovered from the Kratz Creek Mound Group," 59th Annual Midwest Archaeological Conference, Milwaukee, Wisconsin. Amy VanSurksum, Higher Education Administration (Ed.D), International Officer at the University of Glasgow, presented a session titled "Using Professional Competencies in a Global Context to Mentor the Next Generation" at the International Symposium preceding the NASPA National Conference in Indianapolis in March 2016. Co-presenters included Dawn Harris-Wooten, NAFSA Staff; Birgit Schreiber, Stellenbosch University, South Africa; and Tadd Kruse, American University of Kuwait. Sam Harvey, English: Rhetoric and Writing, "Journey to Self-Acceptance in a Culture Demanding Self-Hate." Eds. Michael Monje Jr. and Ian Nicholson. The Spoon Knife Anthology: Thoughts on Compliance, Defiance, and Resistance. Autonomous Press: Fort Worth, Texas. 2016. Part I Publication: http://www.wseas.us/e-library/conferences/2014/Malaysia/ACACOS/ACACOS-02.pdf Part I Title : Flood Prediction and Risk Assessment Using Advanced Geo-Visualization and Data Mining Techniques: A Case Study in the Red-Lake Valley, Part I Co-Authors: Omar Al-Azzam, Deli Sarsar, Mehdi Mekni. Part II Publication: http://k-group.fas.harvard.edu/ Part II Title : N Tiered Entangled Architecture: A 4 Dimensional Predictive Model, Part II Co-Authors: Omar Al-Azzam. Sam Harvey, English: Rhetoric and Writing, was accepted and will be continuing on for a PhD in Rhetoric and Writing at Iowa State University in the Fall. Sam Harvey, English: Rhetoric and Writing, was asked by Autonomous Press to be the co-editor of The Spoon Knife Anthology: Test Chamber, an anthology of poetry, fiction, and memoirs written by neurodivergent people. Kirubel Zelalem Seifu, Computer Science: US9264886, Patent granted by the United States Patent and Trademark Office) - 2016 SCSU Research Colloquium Fellow, Grant Awardee. Amy VanSurksum, Higher Education Administration (Ed.D. ), was elected to NAFSA's national Chair for the International Enrollment Management Knowledge Community. She will serve a three-year term leading professional development and initiatives for the organization. We want to follow our graduates' successes and achievements.